A fine 24-room boutique retreat with a higher purpose than just lodging. A garden and statue in one of the common areas. The perfect place for busy people who have discovered that re-connecting is far more powerful and restorative than dis-connecting. Visitors who will enjoy Lumeria come to unplug, reconnect, restore, explore, learn and experience the present moment in a beautiful island paradise. Lumeria also has classes and programs in organic gardening, watersports, wellbeing, Hawaiian culture, metaphysical studies, hiking & cleanses. Besides the daily classes, there are also special events and workshops throughout the year. Located on Maui’s North Shore just minutes from the ocean between Paia and Makawao; the location is tailor-made for people who are active and want to experience a little of everything that Maui has to offer. A dozen wonderful and uncrowded North Shore beaches are within minutes. The Road To Hana also begins just a short drive from here. Haleakala Crater and Upcountry are closer and more conveniently accessed than from other locations. West and South Maui, as well as the rest of the island, are all easily within reach. There are also unique shops and delicious restaurants in both Paia and Makawao. Maui’s best natural foods store, Mana Foods, and one of the island’s best restaurants (with the best views to match), Mama’s Fish House, are both on the North Shore as well. Lumeria wraps around the central courtyard. Fully restored in 2012, Lumeria is Xorin Balbes’ enlightened reinvention of the 1909 Fred C. Baldwin Memorial Home. A classic example of Hawaiian Plantation architecture, the estate is Listed in the National Registry of Historic Places. 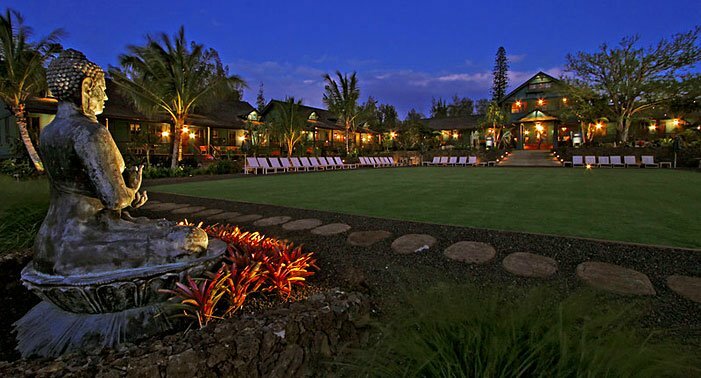 Lumeria sits among six lush and lovingly manicured tropical acres; deep-blue ocean views can be enjoyed as you gaze down toward the shoreline; majestic, sweeping Haleakala mountain views grace the mauka vistas. The main buildings are all connected by long covered lanai walkways, halmarks of the open Plantation style. The lanais hug the large central courtyard in a U shape running along the length of the buildings. The lanais and walkways merge indoor and outdoor areas beautifully. Strolling though the common areas you’ll find several spaces that have been designed in out-of-this-world transformative metaphysical themes. A stately conference area appears as if it awaits powerful shamans to powwow. A lounging area invites you to relax on plush sofas and cushions. Significant crystal specimens, elaborate chandeliers and funky local artwork punctuate a penetrating combination of textures and colors. These are remarkably dramatic rooms that will take a hold of your senses and demand your attention. Common areas are luxuriously metaphysical. Clearly Xorin’s heart-and-soul are in this masterpiece – he left his amazingly successful life working with Hollywood’s elite in real-estate and moved to reside here at Lumeria. There is the obvious added level of attention to detail the staff attains when the creator and owner is on-hand, but perhaps the most impressive aspect at Lumeria is not the stunningly exceptional work on the surface – but that everything here feels as if it comes from a shared space somewhere far deeper. There is something intangible felt here – a visceral sense absolutely impossible for me to capture – undeniably it can be felt when you’re present and breathe Lumeria in for yourself. In striking contrast to the grand common areas, the private guest rooms are well appointed and comfortable, achieving a clean and uncluttered ascetic of zen simplicity. Original artworks from Maui artisans compliment the rooms. Balinese furniture, high-quality bedding, riverstone showers, Japanese tansu vanities. Classy, elegant quality. There is a farm-to-table kitchen and dining room with a professional chef on staff. Daily organic breakfast is included for all guests. Picnic lunches can be ordered, and full (served) dinners are also available. Foods served are organic and locally sourced – in fact, much of the food is grown right here in Lumeria’s gardens. There is an ocean-view open-air lanai adjacent to the dining room so you can also enjoy dining in the balmy island breezes. Maui has no shortage of top-notch Yoga instructors, and Lumeria has hand-picked an impressive selection from our community. Daily yoga is included in the nightly rate, and there are many opportunities to take advantage, both on the Lumeria Property and at their studio in Paia. Outdoor yoga classes are periodically offered in the grassy courtyard as well. There are relics, crystals, statutes and art around every corner. The main building from the courtyard.